...comes the news that 'The Dog Whisperer', the fabulous National Geographic Channel canine series starring Cesar Millan is being flipped, stretched and neutered into a half-hour sitcom for Fox... starring 'That 70's Show' dude, Wilmer Valderrama. 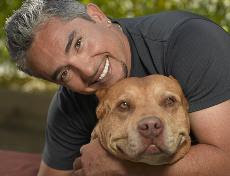 The program currently in development would follow the adventures of a Cesar-esque character -- I really rate Cesar but honestly, have you watched 'The Dog Whisperer'? I wouldn't call him funny. Perhaps it's only humour that dogs would understand? Then again, when did a funny sitcom hit the airwaves in the last few years? Talk about taking a terrific show and mutating it into something cringeworthy.